It may still be December, but we’re already thinking about our resolution to make 2013 our greenest year yet. In addition to those classic resolves to eat healthier, spend more time with family and friends, and maybe shed a few extra pounds, we’re also focusing on reducing our environmental impact. If you’re looking to do the same, simple measures like recycling and composting at home can be a great place to start, but why not harness the power of technology to really make a difference? We’ve rounded up 6 high-tech gadgets that are geared at cutting down energy use at home all year round. From a powerful solar charging kit to juice up all your electronics to an occupancy sensor that turns lights on and off for you to save engery, check out our top 6 gadget picks sure to help you reduce your carbon footprint. Many of these will also make great gifts this holiday season, so leave those ugly Santa sweaters on the store shelf and give your loved ones something that will help someone go green in the new year and save some cash while at it. So whether you’re battling a 100 degree day or a below freezing chill, live in a small space or in a sprawling estate, start 2013 off on a sustainable foot by employing some of these green gadgets in your home! Many people would love to install a complete photovoltaic system to power their home, but they either lack the space or money to do so. 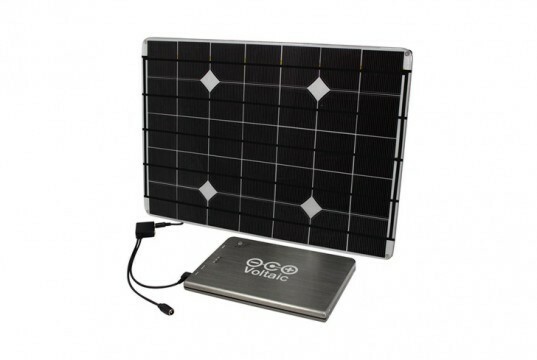 One much less space-intensive—and inexpensive—alternative is the 16.8-Watt Solar Charger Kit from Voltaic. This handy system features a V60 battery that is able to charge everything from laptops to tablets to cameras to several cell phones at once, and its portable and lightweight design makes it easy to move around to wherever you need power. Moreover, if any of the recent natural disasters have taught us anything, it’s that we can’t rely on the local grid in emergencies. Provide you and your loved ones with a little extra peace of mind by ensuring that you’ll always be powered up and connected. We’re all guilty of it, forgetting to turn off lights. If this is you, or someone you know (like your kids), consider employing Lutron‘s Maestro Occupancy/Vacancy Sensing Switch (fun fact: they are the inventors of the dimmer switch!). The handy gadget adds convenience and energy savings to any room in your home by automatically turning lights on when you enter the room and off after a period of inactivity. Using a proprietary sensing technology to ensure lights stay on when the room is occupied, the sensor features ambient light detection that can sense natural light in a room, turning lights on only when needed — perfect for laundry rooms, garages, kid’s bathrooms and closets. 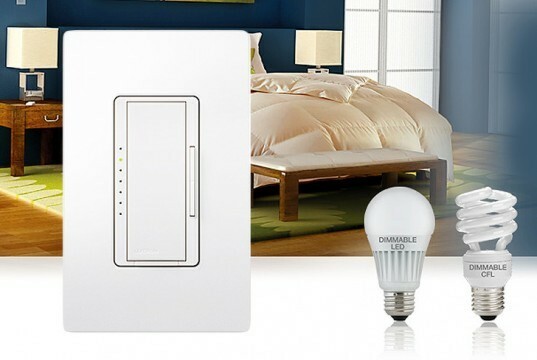 Cut energy usage and create some ambiance in the bedroom, family room or kitchen with the Maestro C.L Dimmer for Lutron. This sustainable, award-winning design is geared for use with incandescent and halogen bulbs, as well as dimmable CFLs and dimmable LEDs. 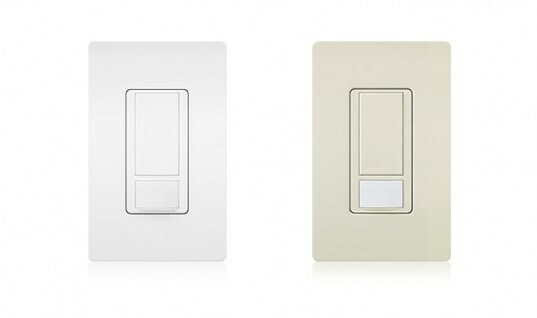 This dimmer offers customizable delayed fade-to-off, which lets you leave a room before the lights go out. And we’ve said it once and we’ll say it again: switching out incandescent bulbs in favor of more energy efficient ones have the potential to cut your energy bill by hundreds of dollars. Pair the Maestro C.L Dimmer with a dimmable CFL or dimmable LED for optimal energy saving — plus you won’t have to worry about them going kaput when you need them the most; the average CFL lasts up to 10 years, and LEDs up to 25 years! The average American household spends more than $2,200 annually on energy bills, and nearly half of that amount is part due to to heating and cooling. One of the easiest ways to dramatically cut down on this number is to install a programmable thermostat. Not only are they inexpensive (some cost as little as $25), but unlike their predecessors, they’re are intuitive, easy to use, and ever-programmable to meet changing needs and erratic schedules. Once installed they can save you about $180 a year — not to mention alleviate some serious discomfort in your home. 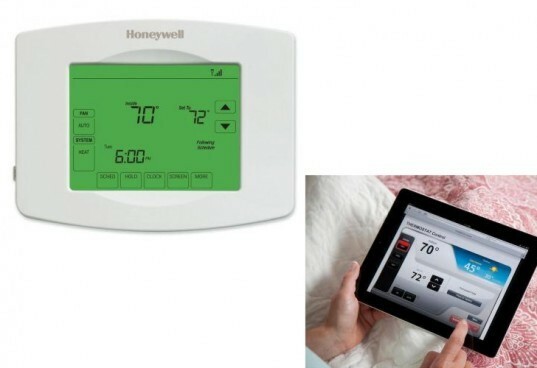 Here at Inhabitat, we’re huge fans of programmable thermostats and Honeywell’s wifi-enabled version really speaks to our gadget- and internet-loving hearts. One of the coolest features this thermostat offers is the ability to adjust the temperature of your home remotely using a smart device like a phone or iPad. You won’t have to worry about if you remembered to turn off the heat after leaving for work, or coming home to a frigid house. Watch our video featuring Inhabitat editor Yuka Yoneda to learn more about these programmable thermostats. While ample windows are a great way to bring natural light into a living space, they also are the cause of heat loss during the winter and heat build-up during the summer. Pair these two elements together and you’ll often find yourself needing to pump up the heat or cooling to keep your home comfortable. While many don’t think of blinds as anything more that a way to block out the sun, the reality is that an efficient set of shades has the power to cut your energy bill all year long. 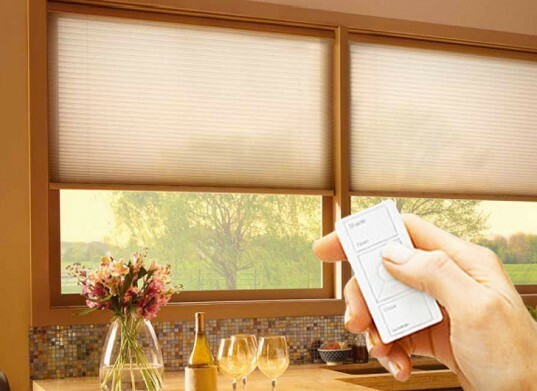 Honeycomb shades are your best bet when it comes to optimizing efficiency and Serena remote controlled honeycomb shades from Lutron are a great solution. These shades are made of fabric that have air pockets that trap heat during the winter and shut out solar radiation in the summer, providing for superior insulation while still allowing natural light to permeate. They’re also totally wireless using D-sized batteries and remote controlled, so you don’t have to worry about cord tangles or your kids and pets tugging on the strings. As an extra bonus, they are completely DIY and can be installed in about 15 minutes, not to mention perfect for creating privacy and covering hard-to-reach windows. A variety of styles and textures make them adaptable to all types of interiors. The average person will use anywhere between 5 to 8 gallons of water per minute while showering, and taking shorter showers is one way simple to cut down on excess water and energy use. But if you’re someone who finds themselves transported to another world when the H2O starts to flow, don’t fret, there’s still hope for you to meet your water-saving targets. 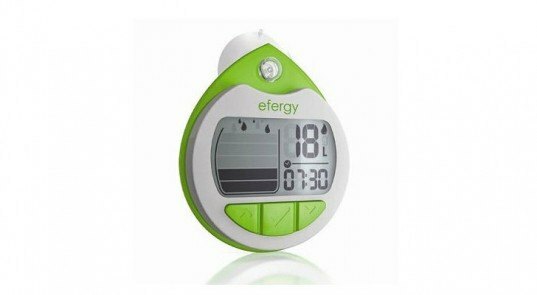 The Efergy Shower Timer and Alarm is a clever little gadget that is able to monitor the amount of water going doing the drain as you lather up. Quickly and easily calibrate it to your shower, set your own target, and then hang it on your showerhead or affix it to the wall using the suction cap. Turn on the timer every time you start your shower and follow the progress on the visual display. The alarm will sound when you have met your target volume of water, letting you know that it’s time to go dry off. The smart device will help you learn how to cut down on time with each shower. This article was underwritten by Lutron Electronics. From energy-saving lighting control solutions to automated window treatments for both residential and commercial applications, Lutron products make any space more versatile, while enhancing ambiance, comfort and productivity. the wifi thermostats are awesome, especially if you are away for several weeks at a time. turn the tstat way down, and when you are coming home, return to the normal setting on your phone or on the web. hard to use 5-8 gal/min when today's shower heads use 2.5 gpm or less. before getting that stoopit shower gizmo, invest in a low flow head first. the nest is more attractive, but the honeywell models are much less expensive. $25 vs $250? You picked a Honeywell t-stat over a Nest? big fan of solar charger kits. been using one to keep my cell phone, ipad, and other gadgets charged. though they are small, the energy they use totally adds up! Those Serena Remote Controlled Honeycomb Shades look awesome and would look great in my apartment! It may still be December, but we're already thinking about our resolution to make 2013 our greenest year yet. In addition to those classic resolves to eat healthier, spend more time with family and friends, and maybe shed a few extra pounds, we're also focusing on reducing our environmental impact. If you're looking to do the same, simple measures like recycling and composting at home can be a great place to start, but why not harness the power of technology to really make a difference? We've rounded up 6 high-tech gadgets that are geared at cutting down energy use at home all year round. From a powerful solar charging kit to juice up all your electronics to an occupancy sensor that turns lights on and off for you to save engery, check out our top 6 gadget picks sure to help you reduce your carbon footprint. Many of these will also make great gifts this holiday season, so leave those ugly Santa sweaters on the store shelf and give your loved ones something that will help someone go green in the new year and save some cash while at it. 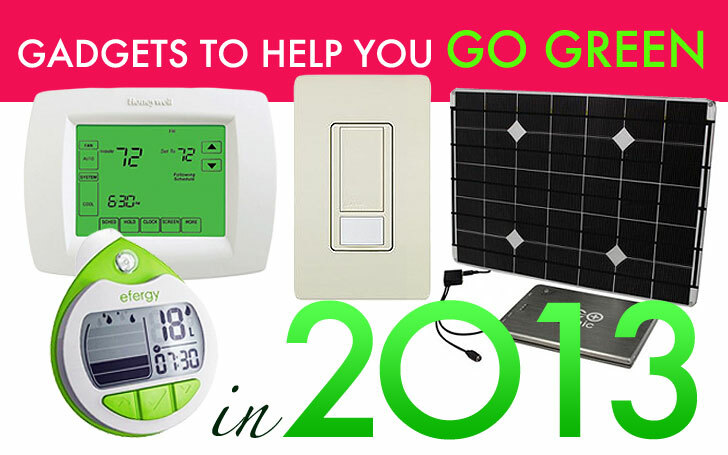 So whether you're battling a 100 degree day or a below freezing chill, live in a small space or in a sprawling estate, start 2013 off on a sustainable foot by employing some of these green gadgets in your home!